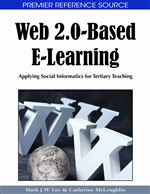 At present, many Web 2.0 activities are being integrated into the e-learning spaces designed for learners. We need to analyze and learn from these activities to derive insights about their effectiveness, in order to promote the systematic application of technology in post-compulsory educational contexts, from undergraduate to postgraduate levels and also in professional training. This chapter deals with one aspect of “E-learning 2.0” (Downes, 2005) practices, specifically the importance of acquiring and mastering a set of personal knowledge management (PKM) skills to perform successfully in the Web 2.0 environment for learning in tertiary education. The authors first present a PKM skills model based around a division into (1) basic PKM competencies associated with the social software web practices of Create–Organize–Share; and (2) higher-order skills focusing on the advanced management of one’s personal knowledge. A learning design model and related examples are presented, aimed at inspiring and guiding tertiary educators in designing and implementing activities consistent with the goal of developing students’ PKM skills. The continuous and radical changes underway as a result of the widespread diffusion of information and communication technologies (ICTs) is affecting the way we come to know and learn using tools, and our social relations and interactions, both as individuals and in groups (Laurillard, 2002). There is a strong case for recognizing PKM skills as a critical asset in today’s professions, in which digital/online and face-to-face actions and interactions are inextricably intertwined.